This morning, I head off for one week of solitude at an inn with no television, no cell service, and no in-room telephone. This rare luxury coincides with the last week of my year as a McKnight Artist Fellow, and I’ll use it to revise the novel I wrote late last summer in San Francisco. I’m grateful for the support of the McKnight Foundation in making this happen, but also to my husband who is going to be soloing at home (though he is also probably going to enjoy the rare luxury of time to devote to one of his hobbies – drumming), the coworkers who will pick up some duties at my full-time job, and to the company that provides me with vacation time, all of which allows me to basically do what the picture at right symbolizes. 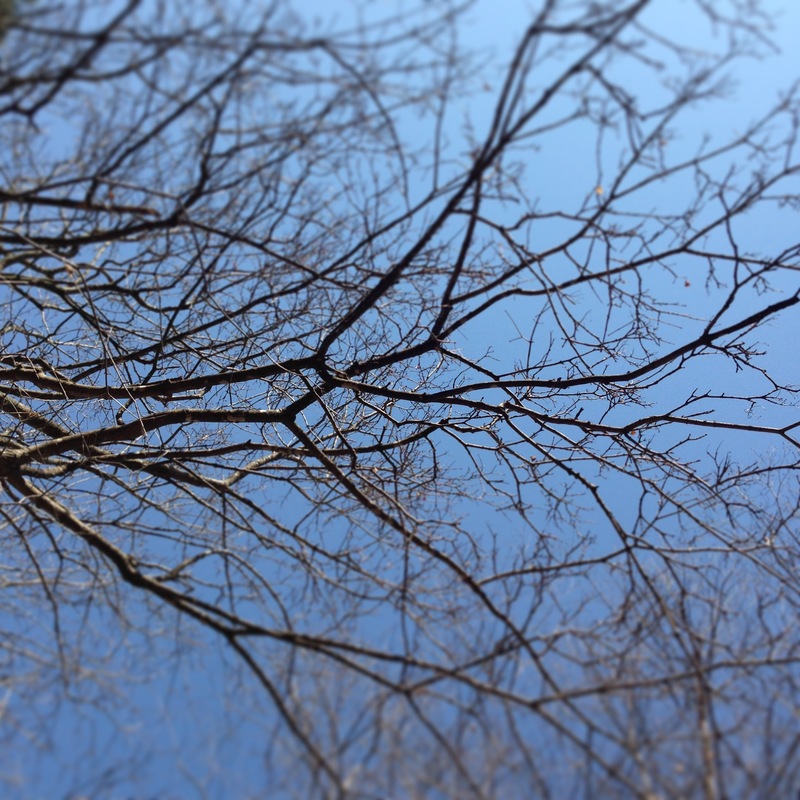 My storyteller’s brain sees those bare tree branches stretching skyward and thinks they’re dreaming of buds, blossoms and leaves－the as yet unrealized possibility of spring. In the north, where this winter is the longest we’ve had in ages, a day like yesterday (70’s, sunny, mild) isn’t taken for granted. It’s best to spend every moment you can outdoors, drinking up the sunshine and the fresh air. As it was Easter Sunday and this involved conversation and a meal with the extended family, it meant that time was spend indoors cooking and gathered round the table, and at a certain age, one is expected to behave like a mature adult and linger at the table, chatting, while the younger ones escape outdoors to play frisbee or flop on the grass. So I felt a little awkward and guilty when I slipped away, and flopped down on the grass outside, a reasonable distance from the family teens, who wouldn’t have liked their over 50 auntie/mom-type to bust in on their conversation. I wouldn’t have minded if some of the older folks joined me out there, but they felt more comfortable inside. I felt a little out of place, out there on the lawn by myself, but maybe it was that writer’s brain of mine at work－that took the risk of feeling guilty and out of place for the reward of a few quiet moments to imagine what the bare tree branches might be dreaming about. This entry was posted in Uncategorized and tagged book, family, fiction, novel, San Francisco, writer, writing. Bookmark the permalink.